Finding parts and accessories for your Great Lakes, Emerald or Spatech spa is easy online. Great Lakes spas used different spa packs and pumps over the years. If the pump runs but there is no water flow, there may be an obstruction in the line or a dirty filter, or air getting into the line. · Assure hot tub is positioned flat and not rubbing against any building part, deck or fence. · If air is trapped in the pump, turn pump off, slightly loosen the pump unions and bleed air out of pump housing. · Make sure that the hot tub has been installed on a flat and properly supported surface. The latest spa models used Balboa Instrument spa packs and parts for the hot tub electronics. Earlier models used the Brett Aqualine spa pack and parts as well as Hercules Performer Series parts and equipment. Some units were also manufactured with the Gecko XM or XE pack. Get Emerald spa parts online and save! Filter sizes also vary with a popular filter being either a 25 square foot filter or a 50 square foot filter with twice the amount of pleats in the same filter size measuring 13 5/16″ high x 5″ in diameter (PRB25 or PRB50). 1. Turn off electrical power to the spa. 2. 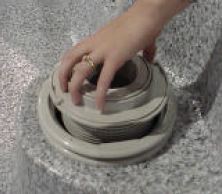 Remove the filter basket by rotating it counterclockwise and lift it out. 3. Remove dirty filter cartridge. 4. Filter Basket and Floating Weir come apart for easy cleaning. 7. Insert a replacement filter cartridge into the filter housing. 8. Reinstall the floating weir and attached basket assembly. 9. Turn electrical power to your hot tub back on and enjoy clean water!